Don’t let the euro’s rallies on the charts fool you! Truth is, the euro zone is still pretty much struggling with the sovereign crisis. We all know that the recent headlines have been all about Greece ironing out the details of its debt deal with its creditors. However, as I mentioned in my article, it has a March 20 deadline to meet and so far we’re not seeing any handshakes over any deal. Consequently, talks about the debt-ridden country leaving the EZ clique have gained momentum and we probably won’t hear the end of it anytime soon. The world’s biggest economies, the U.S. and China, have been showing signs of slowing growth. Earlier this month, we heard the Fed downgrade its economic prospects for the country. From the initial estimate of a 2.9%growth for 2012, the forecast now is for the GDP to come in lower at 2.2%. Then for 2013, economic growth is anticipated to clock in between 2.8%-3.2% after previously estimating it at 3.0%-3.5%. And it looks like Big Ben and his merry men were right on the money for bracing the markets. Just last week we saw the advance GDP for Q4 2011 disappoint expectations for a growth rate of 3.0% and printing at 2.8%. As for China, I also reported that its most recent GDP report showed the slowest pace of growth in ten quarters in the last three months of 2011 at 8.9%. Data from the Australian Bureau of Statistics showed that inflation pressures were stagnant in the fourth quarter of 2011. The figure disappointed expectations which were for an increase of 0.2%. Consequently, this has gotten a few analysts saying that we could hear another rate cut from the RBA. You see, very high inflation levels in Australia has been a pain in the neck of central bankers and has previously forced them to hike interest rates to shore up excess liquidity. But now that inflation pressures seem to be easing, the RBA has more room to cut rates in order to help spur economic activity. Recent reports from the Land Down Under only give the RBA to more reasons to cut rates. Earlier this week we saw that building approvals in December contracted by 1.0% and fell short of the market consensus for a 2.1% growth. On top of that, the country’s labor conditions are worsening with the employment change report for December showing a 29,300 decline in jobs. Yikes! Looks like the cards are lining up for an interest rate cut, aren’t they? The question is what will happen to AUD/USD if the central bank DID cut its rates? Let’s take a look at its price action the last two interest rate decisions. Back in November when an RBA rate cut wasn’t anticipated, the 25-basis point rate cut to 4.50% surprised markets and inspired a 250-pip drop in AUD/USD. The pair found support at the 1.0300 handle and ended the day just below 1.0350. Meanwhile, when trading volume was winding down in December, we saw AUD/USD start to drop even before the interest rate statement was released. The pair had fallen down by more than 50 pips already before the actual rate cut dragged the pair by less than 100 pips. It’s also interesting to note that the pair eventually erased most of its losses by the end of the day. Right now a lot of market players are predicting another interest rate cut. While some are speculating that it will go down to 4.00%, others say that the reasons stated above aren’t enough, and that the Australian economy is still pretty stable even without an interest rate cut. Whether the RBA is going to cut rates or not, it’s probably more important to consider other scenarios that might play out. What if the RBA cuts its rates by 0.50% instead of 0.25%? What if the RBA doesn’t cut rates at all? What if the RBA cuts its rates but traders already start pricing it in like what happened in December? Of course, these are only some of the examples that I hope you keep in mind if you’re planning to trade the RBA’s decision. I hope you have a trading plan in mind for this one! 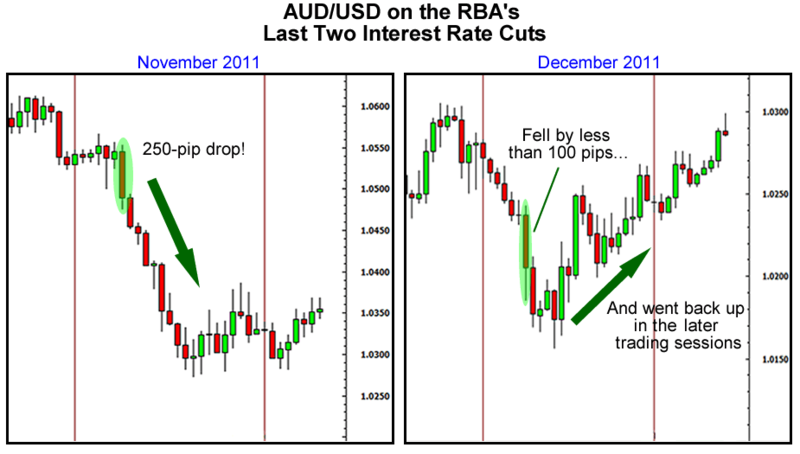 How do you think AUD/USD will react to an RBA interest rate cut?